This reviewer obtained a copy of the book from her local public library. In a few short months the middle and high school students who frequent my public library will be on the hunt for a biography for a class project. Most of them will ask for books about movie or sports stars, but there is always a few who are interested in something different. I believe this biography of Georgia O’Keefe will be quite satisfactory. When I first saw Susan Goldman Rubin’s book on Georgia O’Keefe, I thought, “Do we really need another biography about Georgia O’Keefe?” Marketed as a book for Young Adults, I wasn’t sure they would care to know about one of Twentieth Century’s famous masters of art. I was so wrong. After reading Rubin’s book thru twice I say, "Yes! We do need this particular biography and Young Adults will find much to inspire them." The Georgia O’Keefe I knew was through the camera lenses of her husband, Alfred Stieglitz. She seemed intense, unsmiling, and remote. I had difficulty connecting that image with those large, colorful, and quite breathtaking paintings she produced. How could this woman who looked so severe and wore black clothing be able to see (and I’m talking about seeing with an artist’s eye) all the amazing flowers, bones, and landscapes she painted in such vivid colors? In very short chapters, many only 3 or 4 pages in length, Rubin gives an excellent overview of this amazing woman. Born on November 15, 1887 in Sun Prairie, Wisconsin, Georgia was the second oldest of seven children. She possessed a sense of humor, was loyal to her siblings and friends, and from early on possessed a strong desire to draw what she saw. Though her household may have been hectic, happily her parents, along with many teachers, recognized Georgia’s talent and encouraged it. Growing up at a time when women did not have a career, but married and devoted themselves to raising children, O’Keefe bucked tradition. She went to college, supported herself with a variety of jobs, lived on her own, and continued to pursue her deep desire to be an artist; to support herself with her art. Rubin has written many award winning books about artists (Andy Warhol: pop art painter) Here, she speaks frankly on the relationship between O'Keefe and Alfred Stieglitz, 23 years her senior, and his influence on her career. 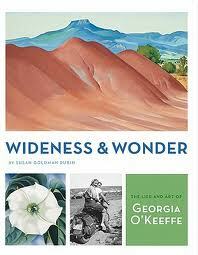 The book's emphasis on O'Keefe's dedication to her art will be especially appealing to Young Adults. Also, the design that has black text on pages that alternate in colors and is loaded with photos of O’Keefe and reproductions of her paintings. It is refreshing to read how Georgia shunned the glamorous life in NYC and all the other trappings of stardom in order to paint. She lived and breathed painting. This is in no way a comprehensive biography. 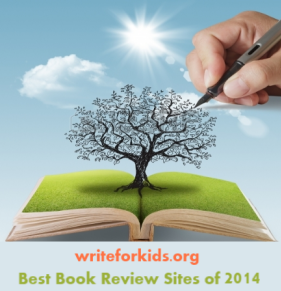 However, it will satisfy the dreaded biography assignment, yet offers so much more. It will whet their appetite and give them someone else to emulate besides Kristen Stewart or Rob Pattinson. Watch Georgia talk about her work and her love of New Mexico.